Forward Magnus Wernblom, aka 'Mr. Modo', is the all-time franchise leader in goals, points and games played for Modo Hockey Örnsköldsvik of the Swedish Elite League. Magnus Wernblom has never played a professional game in North America, but he has made a living for the last 18 years playing a North American brand of power hockey. The soon-to-be 35-year-old Swedish winger’s bread and butter is to camp out in front of the opposing net, screening the opposing goalkeeper while collecting goals off deflections, rebounds and scrambles around the crease. He also performs a lot of the dirty work in deep -- battling behind the net to dig out loose pucks, throws his weight around and draws penalties. It’s unglamorous, but important work, and Wernblom does it as well as anyone. The all-time franchise leader in goals, points and games played for Modo Hockey Örnsköldsvik of the Swedish Elite League, Wernblom has earned the nickname “Mr. Modo” for his long, meritorious service to the club. In addition to his team scoring records, he is also rapidly closing in on the all-time Elitserien goal record. “Werner” currently ranks third on the all-time Elitserien goal scoring chart with 256 regular-season goals, including 19 this season. By the end of the 2007-08 campaign, he stands a good chance to catch former Calgary Flames star Håkan Loob (262 goals) for second place. Assuming Wernblom remains healthy next season, he should then surpass Lars-Gunnar Pettersson’s all-time Elitserien record of 270 goals. Historically, Swedish players have been known for their speed, finesse, and a slight reticence to shoot the puck. Even as a young player, Wernblom never fit the mold. “The only way to score a goal, you know, is to shoot, that’s my philosophy in any case,” he told HockeySverige after surpassing 1970s-1980s star Tommy Själin for the franchise point record in October. The veteran winger is also rapidly climbing the all-time Elitserien games list. He is 14th with 644 league games played. Longtime Luleå HF defenseman Roger Åkerström holds the record with 804 games. Wernblom is cut from the same cloth as Detroit Red Wings’ standout Tomas Holmstrom. The two have an almost an identical skill set, are virtually the same size and are the same age (Holmström was born Jan. 23, 1973, while Wernblom is 11 days younger). Wernblom and Holmström have successfully overcome skating deficiencies, and are less naturally talented than a multitude of both European and North American players whom they’ve outscored and outlasted in the sport. Both players were late bloomers who were unheralded prospects as teenagers, and were late-round NHL picks. The Los Angeles Kings drafted Wernblom in the ninth round (207th overall) of the 1992 Entry Draft, while Detroit chose Holmstrom in the 10th round (257th overall) in 1994. In the heat of battle, neither player has endeared himself to opposing players or coaches. From time-to-time, both have been accused by rivals of diving or of dirty play, although it’s also true that the players routinely absorb tremendous punishment in their own right. But both are immensely respected around the game for their work ethic and competitiveness. The biggest difference? In 1996, Holmstrom got a shot at playing in the NHL and went on to become one of the NHL’s top supporting-cast and playoff performers, while Wernblom was never offered an NHL contract. Wernblom has always been more a steady goal-scorer on a year-in and year-out basis than one who posts eye-popping numbers in certain seasons. His typical goal output has been about 14 to 25 goals over the course of the 50-game Elitserien regular season. At his age, Wernblom realizes that an NHL contract is no longer a realistic possibility for him. “Unfortunately, it’s a little too late,” he said to Expressen. But the player has no regrets about playing at home. During his Modo career, “Werner” has gotten to play with and against a who’s who of players in Sweden, ranging from future NHL stars like Peter Forsberg, Markus Näslund and the Sedin twins, to the likes of Andreas Salomonsson and Per Svartvadet, who have had greater success at home than they did during their NHL stays. Wernblom got his start in his hometown of Kramfors, scoring 16 goals in as many games at the Division II level. He was also an accomplished younger soccer player for Kramfors Alliansen. In 1990, he was recruited to play in Modo’s world famous junior development program in the small city of Örnsköldsvik. “The hockey gymnasium in Ö-vik felt more right to me. In the end, hockey was an easy choice for me,” he explained to Expressen. Wernblom broke into Elitserien during the 1990-91 season, playing 16 games and scoring four goals. The same year, both Forsberg and Näslund cracked the big team’s roster. Likewise, future New Jersey Devils and Washington Capitals forward Salomonsson also broke in that season. Magnus Wernblom was drafted by the L.A. Kings in the ninth round of the 1992 Draft, but was never offered an NHL contract. Wernblom did not truly come into his own at the Elitserien level until he was about 23. He was routinely overshadowed by Forsberg and Näslund in particular. After being drafted by the Kings, Wernblom played a supporting role for silver medalist Sweden at the 1993 World Junior Championships (the same year that Forsberg posted a tournament record 31 points in seven games and Näslund had 13 goals and 24 points). Wernblom’s breakthrough season came during the 1995-96 campaign. Although limited by injury to 28 games, he had 16 goals and 23 points. The following year, he started every game for Modo and enjoyed a 26-goal campaign (still his single-season high in Elitserien, which he also accomplished in 2002-03). Over the next seven seasons, Wernblom’s gritty play down low in the offensive zone was a constant that Modo could rely upon year after year. Three times he cracked the 20-goal plateau, scoring many of his goals from his stomach, his knees, or off of his equipment. “Every team needs a guy like Wernblom on the team. He’s one of those players who you hate to play against and like when he’s on your side,” former teammate Forsberg said. An era came to an end in the spring of 2004 when “Mr. Modo” left the club and signed with Skellefteå AIK to play in Allsvenskan. With an NHL work stoppage looming that year, Modo loaded up on talent in an ultimately unsuccessful effort to win their first Swedish championship since 1979. Among others, Forsberg, Daniel Sedin, Henrik Sedin, Mattias Timander, goaltender Tommy Salo and later, Näslund and Adrian Aucoin, signed Modo contracts. There was only so much money to go around, and so many roster spots to be had. Wernblom enjoyed three highly successful seasons in Skellefteå, where he was a team leader off the ice and the club’s biggest scoring threat, especially on the power play. In 2005-06, he was instrumental in securing SAIK’s return to Elitserien, scoring 37 regular season goals and adding four more goals and nine points in 10 postseason games during the qualification tournament for Elitserien. Last year, Wernblom showed that he could still get the job done in the Elite League, scoring 25 goals for SAIK. 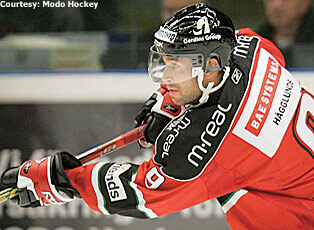 In the spring, he announced his intention to return to Modo for this season. 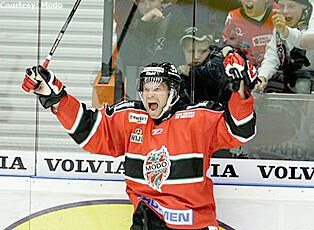 Modo subsequently went on to win the 2007 championship. “I wanted to go back to Ö-vik mainly for social reasons, not for the money. It worked out in every way, although I had a wonderful time in Skellefteå. Of course, I’m also hopeful of winning a championship, even if we in Modo are a long way out right now,” said Wernblom. As Wernblom alluded to, Modo’s quest for a repeat championship has been a bumpy ride for most of the season. The team played inconsistently until a recent hot streak. Currently, the club sits in a fifth place, tied with Linköpings HC with 61 points (Modo has a game in hand). Modo is just one point behind Färjestads BK and three points back of second-place Timrå IK. HV-71 Jönköping remains comfortably in first place with 77 points. Wernblom has been central to the Modo attack this season, leading the team in goals (he’s tied for fourth in the league) and second in points to Salomonsson. Twelve of Wernblom’s 19 goals have come on the man advantage. “Werner” recently recorded a hat trick in a 4-2 win over Mora, prior to an 8-2 road loss against the Frölunda Indians, which snapped Modo’s winning streak at six games. Any player who plays Wernblom’s style is bound to accumulate various bumps and bruises through the season. The power winger’s pain tolerance and durability are renowned. Swedish hockey may be less physical than the North American variety, but there’s a price to be paid for camping out in front of the net. Modo also participated in the recent IIHF European Champions Cup tournament in Russia, performing poorly. Wernblom was one of the few Modo players who turned in a good showing in the mini-tournament, scoring the club’s lone goal in the two games it played. When it was over, Wernblom was happy to go home for a variety of reasons. “It feels good to load up on Swedish food. I can say that I didn’t take home any recipes from Russia,” he joked to Allehanda. More importantly, with the ECC behind them, Modo and Wernblom can now focus solely on playoff preparations. If the player has his way, the pursuit of the Swedish championship will take central focus instead of his chase for Elitserien goal scoring.